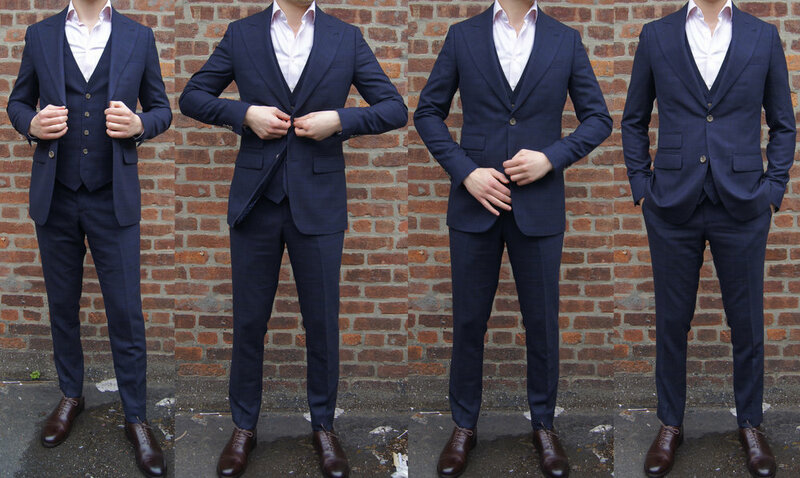 Note: This is part two in a two part review of Indochino’s custom suits. Read the first part first, here. Because I really wanted to nail the fit, I decided to go back to their store in order to be fitted a second time and be able to make the tweaks with their staff, in person. While booking appointments is sometimes annoying there, and not every staff member is as knowledgable or as helpful as the next, it was still better to go in person than simply make these tweaks over the phone or email with customer service. A second fitting is highly, highly recommended. I brought up all the above mentioned tweaks that needed to happen, and Indochino gladly remade the jacket and vest to the new specifications, and tailored the pants for free as the tweaks were able to be made without a full remake (or so they thought; read on). Somehow, it took them as long to tailor and ship the pants to me from NYC as the rest of the remake took to do, but, in the end, I ended up with my second version of my suit just about 14 days or so after the second fitting. So, pretty quick. And, this second fitting is much, much better. It’s almost perfect, but still not quite there. Minor tweaks could be made to the sleeves, for instance to make the fit better, like a pitch adjustment to help with creasing, and a bit more fabric taken out of the bicep, and a bit more added to the cuff opening. The sleeves are also too long, as is the jacket length by just a tiny bit. The waist is also pulling a bit in the back, and so could use just a bit of extra room there to help smooth that out, as well as fix the way the vents drape over the rear. The vest fits perfectly this time around. The pants, though, were not able to be fixed by mere tailoring. While the taper is now absolutely perfect in my opinion (though they were over-shortened), the seat is still to tight. You can see this somewhat in the pictures, but you can also just take my word for it without wanting to get to graphic. It pulls and feels uncomfortable, but there is no more fabric in the pants to let out in the seat. Thus, these need to be remade with a bit more room through the seat. Once these last tweaks are made, I should end up with a suit that fits as close to perfect as one could hope, right out of the box, no extra tailoring at all. And that is a pretty amazing thing. I called up Indochino, and while it took a bit of following up and staying on top of things, they were super helpful and accommodating over the phone, and eventually I spoke to a stylist that sat with me and went over all these changes. He suggested one or two minor tweaks of his own, we decided on exact amount of fabric (all alterations except for the seat adjustment were under half an inch), and then we put an order in for a second remake. Yes, that is right! Indochino gladly remade my suit jacket a second time, and remade the pants as opposed to attempting to tailor them again as now we all saw that would not be enough. As of this review, I am still waiting on this final suit to arrive, though the current suit is certainly close enough to perfect to be more than wearable, and worthy of this review in its own right. Indeed, even after this final version comes, there will still likely be really tiny changes or tweaks I might want to make to my next suit, as the more I wear and see how things really feel and sit on my body over time, I might want to make slight adjustments. And this is the beauty of MTM and companies like Indochino. I don’t need to go back for a fitting anymore, nor to a tailor ever. If there is a slight tweak I would like to my next order, I can just call them up and have them add it. Thus, each suit will fit progressively better and more perfectly, especially since bodies change slightly over time. Once you’re locked in with Indochino, you can just order and order and order, and never worry about how it will fit. Again, while back in the day, Indochino quality was dubious, they now seem to make a really fine garment. As always, to some extent this will depend on what fabric you choose. The fabric my suit is made out of is a super 120s wool, and it’s very nicely textured and patterned, and looks great. Some fabrics of theirs might feel a bit cheaper, though the lowest they go is super 110s that I can see, which is just fine. Of course, super count is not the only thing that matters for quality — it’s just a measure of fineness. Still, this fabric feels substantial, and rich, and like a quality soon. Consider SuitSupply entry level, and I would say that this is a tiny step below that. And that applies to the overall construction as well. All the stitching is neat and clean. Buttons feel solid and are sewed well. All the detailing is nice quality as well, from the lapels, to the pockets, to the interior lining and vest as well. Everything is well made, and there is really nothing negative to say about how this suit is constructed. (If I had to pick one thing, it would be that the side adjusters are placed below the waistline; I prefer on the waistline. But even the side adjuster feels like a quality piece.) Again, quality really comes in just a bit below SuitSupply. The suit feels just a tiny bit less substantial, and the fabric just a tiny bit less rich. But, you’re also paying at least $100 less for the suit, but I would not go so far as to say it is $100 less in quality. Maybe about $50. So, if SuitSupply will run you about $500 or so, Indochino would be about a $450 suit — but you can get them for below $350. And all of this is not even to mention SuitSupply’s Premium and Luxury fabrics, some of which incorporate cashmere into the blend, and look really nice — though I don’t have personal experience with these. As far as canvassing, while it is not plastered all over their site, Indochino does use a half canvassed construction (more on this here), and if you land on the right page, they do explain this. 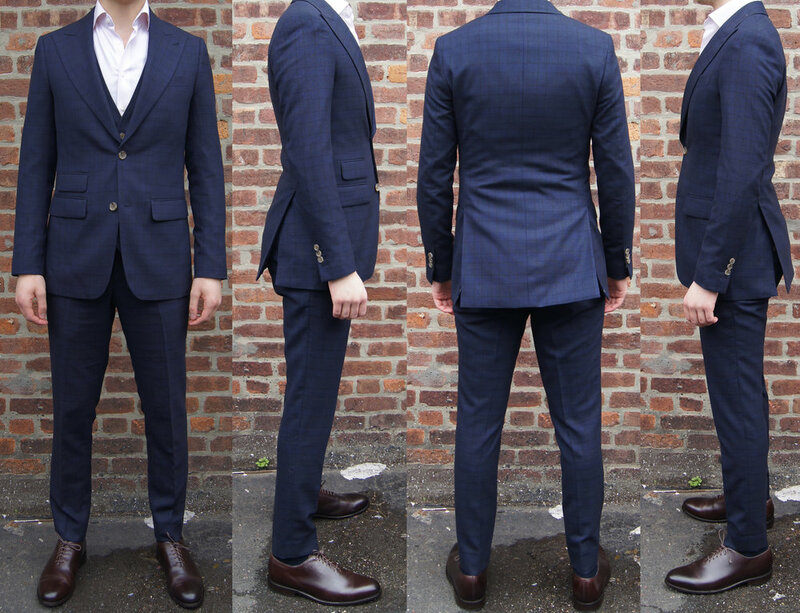 Again, for comparison, SuitSupply also uses half canvassed construction.